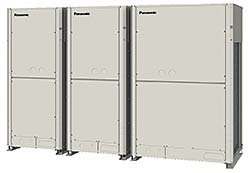 ECOi EX Series includes combined 2-way and 3-way ECOi VRF heat pumps. Features a dual large-capacity inverter compressor and combined triple-surface heat exchanger to support increased heat exchange performance by 5 percent. A single-surface fan guard and curved bell mouth prevent swirling and increase flow rate.